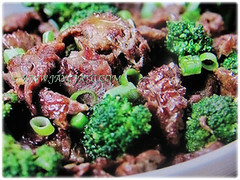 Broccoli or Wild Cabbage has become established as an important human food crop plant, used because of its large food reserves which are stored in its leaves. 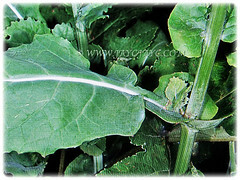 The vegetables of Brassica oleracea are consumed in large quantities across the globe. They are an important source of dietary fibre, vitamins C and E as well as a range of B vitamins and carotenes. Common Names: Broccoli, Wild Mustard, Wild Cabbage, Mega Cabbage. Etymology: The genus name Brassica is from the classical Latin name for cabbage. The specific epithet oleracea means of the vegetable garden. Origin: Native to coastal southern and western Europe. It’s cultivated elsewhere around the globe. Plant type: A herbaceous and flowering plant. 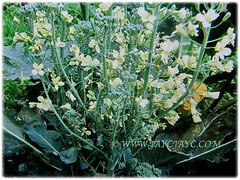 Features: Brassica oleracea is from the genus, Brassica that comprises of 37 species of flowering plants. It is an annual or biennial herbaceous plant that grows up to 2.5 m in height when in flower. Its stem is smooth, more or less woody. Large leaves are green to blue-green in colour. The lower leaves are stalked. Its leaves are compound, made up of two or more discrete leaflets, lobed or unloved but not separated into leaflets. The leaves are alternately arranged with one leaf per node along the stem. The inflorescence appear in the center of the plant with large green heads and short, thick stalks. Flowers are coloured pale yellow with four petals and sepals as well as 6 stamens in the flower. Both the petals and sepals are separate and not fused. The inflorescence is harvested as vegetable when young. 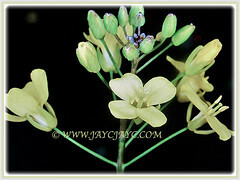 If the plant is allowed to grow, it will produce yellow flowers. 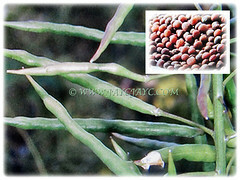 Its fruit, measuring 25-100 mm is a slender capsule that changes from green to tan or light brown and splits open when ripe to expose the seeds. 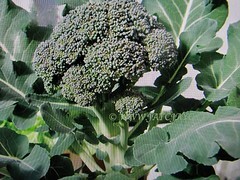 Culture (Care): Brassica oleracea or Broccoli grows easily with the least maintenance. Moisture: High to medium water requirement. Keep plants consistently moist. Soil: Humus-enriched, loamy, moist and well-drained soils. Others: Too much cold and heat, not enough water, too much water, not enough lime, or too much nitrogen, and you end up with small, misshapen or rotted heads. Generally free from serious garden pests and diseases. However, potential insect problems include cabbage worms, cabbage loopers, flea beetles, caterpillars, thrips, slugs and aphids. Watch out for leaf spots, blackleg, black rot and yellows. 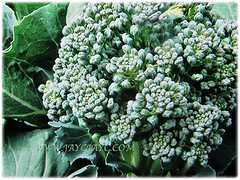 Brassica oleracea or Broccoli prefers a temperate climate and grows best in cool weather. It can tolerate light frosts and temps down to -3.8 ºC or so. 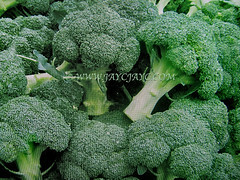 In general, the ideal temperature for growing Broccoli is 18-27°C. It has become established as an important human food crop plant, used because of its large food reserves which are stored over the winter in its leaves. Can be difficult to grow well in large pot because it has little tolerance for heat, drought and cold. Propagation: Easily propagated from seeds that usually germinate in about a week. 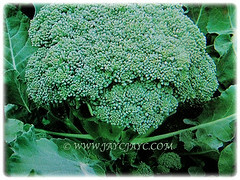 Usage: Brassica oleracea or Broccoli produces a large tree-shaped flowerhead which is consumed raw or cooked when the flower buds are still green and unopened.